I travel the world installing TV equipment for business. I enjoy computers, 'techy toys', but I really love to kick back in the outdoors. I love to ride, and enjoy riding my Harley. I enjoy feeling the breeze in my face and the sound of the engines. I ride with a fantastic group of friends, we ride for the fun and comaraderie, a charity event just makes it a plus. However, motorcycling is not all there is to my life. I enjoy being outdoors, so motorcycling plays a major role, but I try and round it out by exploring new places. Then there is always biking, hiking , fishing, picnics and photography. I enjoy mountain biking through the woods and nature trails scattered around Illinois. I fish IL, WI, and MN with Shelbyville, IL and Leech Lake, MN, being my favorite areas. Winters are passed with pool, the health club and music. I have a few favorite local bands that I try to follow through the small club scene. When I can mix business (a trip to the home office) with pleasure, I like to snowmobile in Utah, its one of those wind in the face things. I was born and raised on the East Coast. I spent a lot of time wandering the back streets of Washington , DC, as well as the back roads of Maryland and Virginia. In 1967, Uncle Sam provided me with the opportunity to wander the West Coast and the blue Pacific until 1971. Then it was back to the East Coast. In 1980, I was migrated to the Chicago area as a field engineer for an electronics manufacturer. Chicago is not a bad area, the winters are too cold and the land is flat, but the summers are gorgeous. However, biking sort of got set on the back burner as business travel increased. I have traveled all over the world, installing equipment in television stations and meeting the most interesting people in the world. A quick year living in Germany, proved to me that Americans just don't know good beer. Life in Europe spoiled me for Pilsner beer and taught me how to kick back and enjoy the beauty of life, 'don't hurry, be happy, life has more purpose than work'. Well, family circumstances changed a few years ago, the house is now empty. My son graduates this year as a major in "Fitness and Strength Training" and looks like he could be WWF or WCW material. His minor was pool and darts; oh, for those kind of courses when I dropped out and enrolled in the college of hard knocks. My first ride, was a '71 Honda CB-350, and then a '72 Triumph Bonneville (sucked). In 1973 (the AMF years of Harley Davidson), I bought a FLH-1000 Sportster,. I had to nickname the bike "spot" because if it didn't leak oil, it was not going to start. However, it was a runner and we racked up many miles on trips through the Blue Ridge Mountains of Virginia. 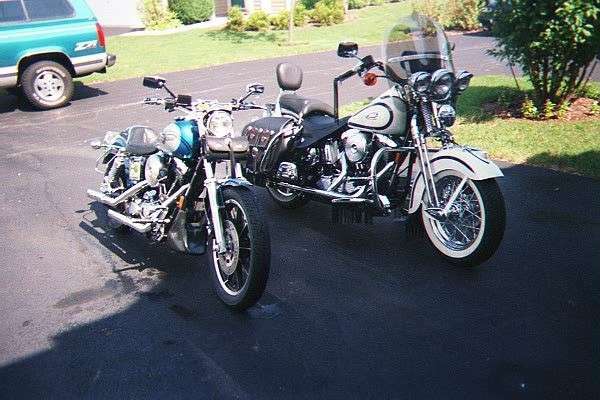 My new rides are a '95 Dyna Low Rider and a '97 Springer Heritage. What a change, no chain, no oil leaks, "spot" was gone. The Dyna has now become a solo "low rider", nicknamed the "Blue Streak", and the Springer is for 2 up touring. Both bikes are tricked out with 'goodies' and modifications, the personal touch that makes your Harley unique.